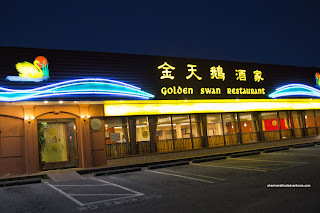 Recently, I was approached by Raymond Chow about joining him and other bloggers for meals at Chinese restaurants in order to highlight signature dishes. The rationale behind this is that many Chinese establishments do not have a Net presence. In fact, many of them exclusively advertise in Chinese print media. In that sense, they are not reaching out to over half of the population (and those who don't read Chinese!). 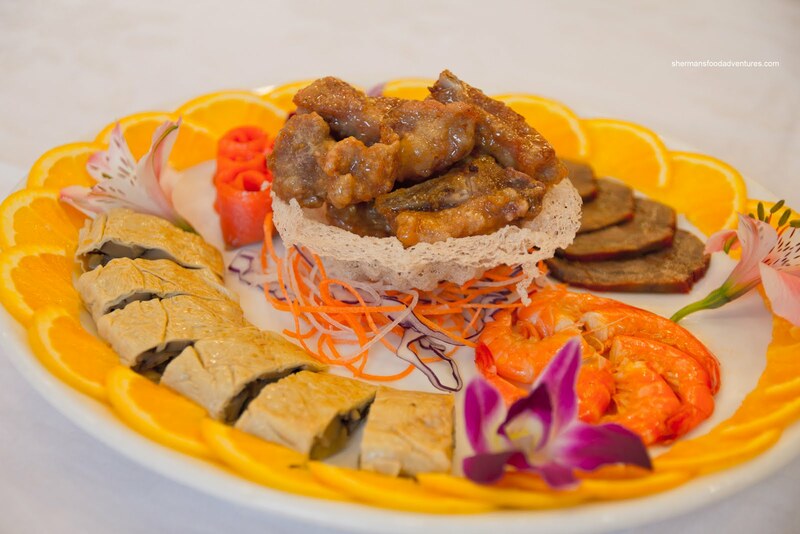 On his site, ChineseBites, he hopes to bring awareness to authentic Chinese cuisine to everyone. The initial intention was to pay for our meals (or at least part of) at the restaurants we eat at as a group. However, as expected, many of the restaurants decided to comp our dinners. Not really a surprise since this serves to promote each restaurant at their best (and of course we'd get good service... duh...). Therefore, I've personally decided that my posts about these dinners will not be a "review" per se (not linked to Urbanspoon), rather they will be about my experiences with these recommended dishes. Drive in Vancouver. They c hanged ownership last year with the owners of Golden Ocean buying them out. In addition to Raymond and myself, others at the dinner were Kevin, Rick, Alvin and Louisa. Like many Chinese set meals, we started off with the Golden Swan Appetizer Platter consisting of Smoked Salmon, Beef Shank, Shrimp, Mock Goose and Honey Garlic Spareribs. This was pretty typical and nothing was amiss. I did like the beef shank as the slices were thick, yet at the same time, the meat was moist with definite hits of five spice. Next up was a beautifully plated dish named Soft Tofu in Japanese Style. Huh? Yah, that's what I thought too. Something got lost in translation. Whatever the case, the dish consisted of delicately sliced silken tofu fanned carefully around the plate. 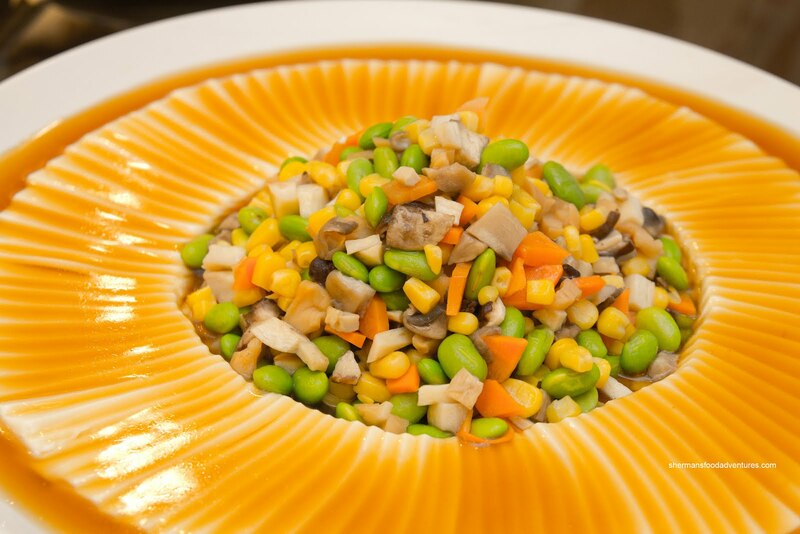 At the centre, there was a stir-fried mix of edamame, corn, carrots, shiitake and preserved radish. The vegetarian mix was still crisp and vibrant while the silky sauce was mild. The one thing that kept this dish from boredom was the preserved radish. It provided crunch and saltiness. 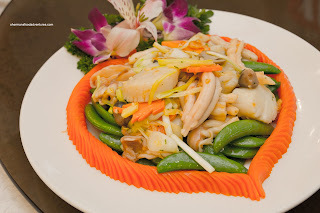 Next was another nicely plated dish - Sauteed Geoduck and Scallops with Sweat Peas. Now this is usually a pretty common combination of ingredients, however, they added different herbs including lemongrass. Hence, the flavour profile was completely different. There was a certain aromaticness to go with the natural sweetness of the seafood and crunchy snap peas. 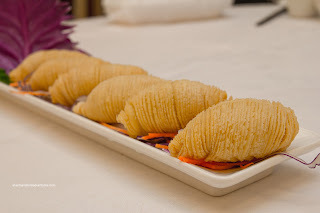 One thing of note, there was no "Geoduck" in the dish, rather, they were sea cucumber innards. Moving along, the next dish to arrive was the Sauteed Beef Tenderloin with Chayote in Black Pepper Sauce. The chayote was still crunchy while cooked all the way through. With the addition of strawberries, it further accentuated the sweetness of the dish. Naturally, the sweetness was accented by the a mild amount of black pepper. The chunks of beef were tender, yet still meaty in texture. However, I found it to be rather salty. 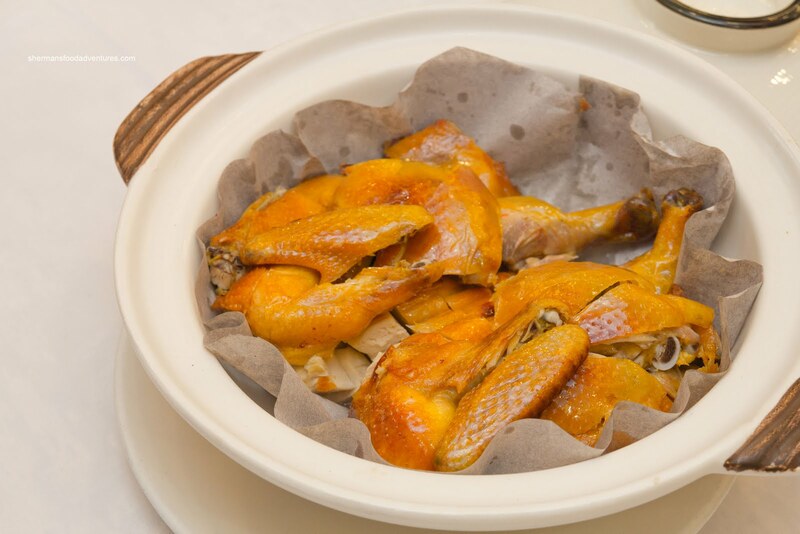 Majestically golden brown, the House Special Salty Chicken was presented in a clay pot. This was cooked in a salt crust which was removed just before serving. I asked if they had quickly oil blanched the chicken first because of the crispy skin. Apparently they did not, so this was achieved via the baking process. The chicken was moist even with the white meat. I found it to be only moderately salty despite the salt crust. Next was definitely not a fan favourite at our table. The Egg White Custard with Almond Milk was a white blob of food which neither had enough flavour nor texture to maintain our interest. 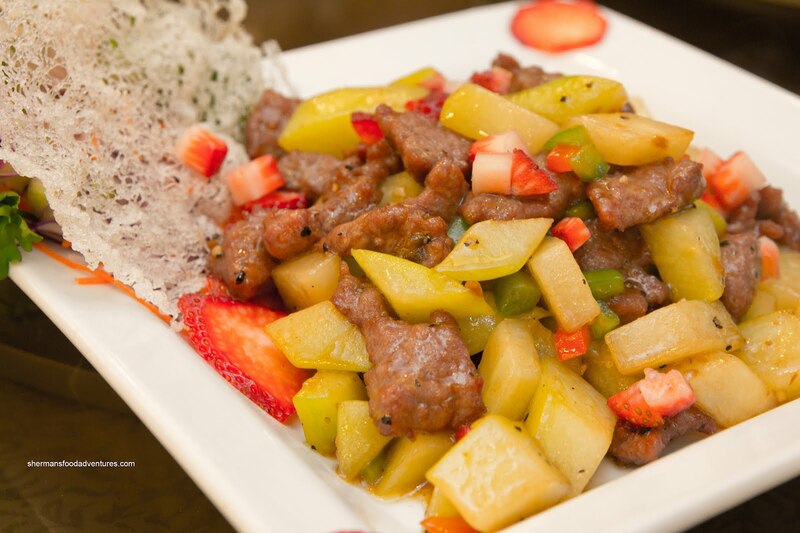 There were bits of Asian pear that only served to add to the overall sweetness of the dish. There wasn't enough crunch to alleviate the mushiness of the blob. Elegantly plated was our next dish - Angel Hair with Tiger Prawn. The fried prawn was doused in a ketchup, sweet chili sauce and garlic concoction accompanied by some angel hair pasta. Yes, some fusion thing going on here. However, it was not anything dissimilar to items found at a Hong Kong style cafe. 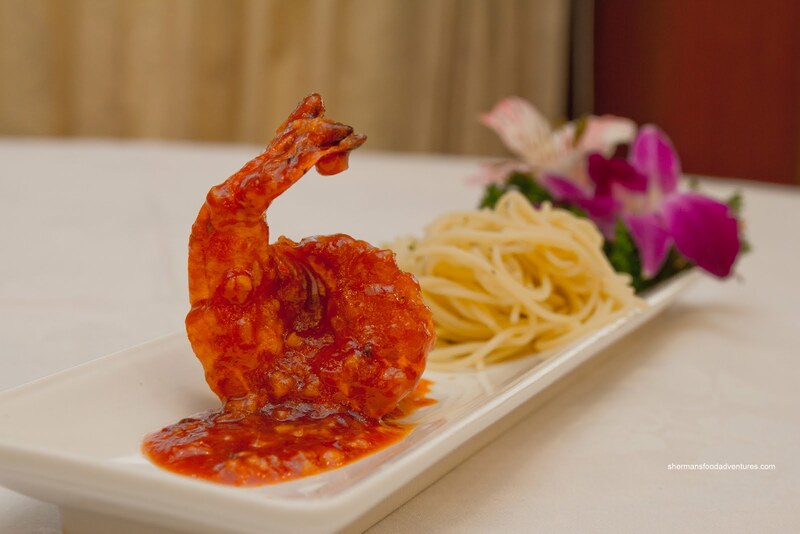 I found the sauce to be rather sweet with the prawn being cooked perfectly. 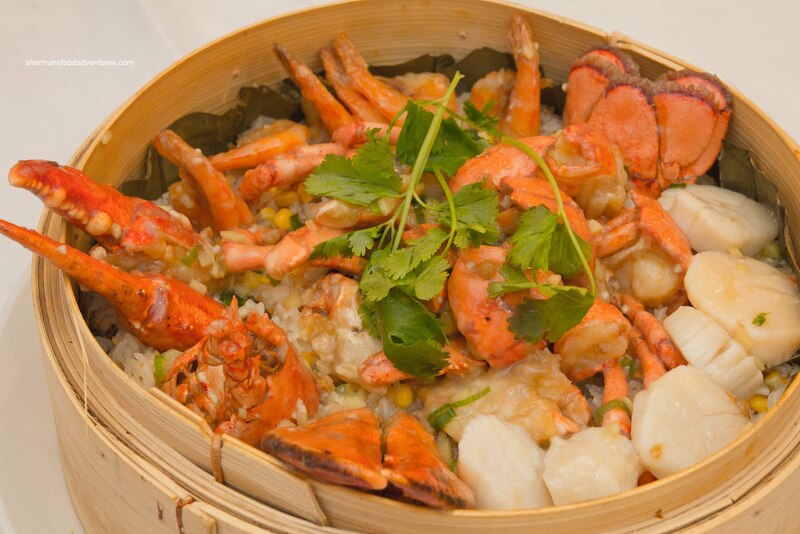 Our last savoury dish was the Lobster, Scallops, Shrimp with Rice on Lotus Leaf. I've seen this dish many times before, however, not with shrimp and scallops. Me thinks that we got the royal treatment here (duh...). So everything was prepared carefully. The scallops and prawns were just cooked while the lobster was fried beautifully. The rice at the bottom soaked up some of the flavour from the seafood as well as the sauce. 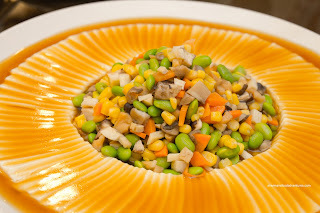 The addition of corn along with Chinese sausage, mushroom, tobiko and green onion added pop to the rice. Onto dessert, Kevin was hoping for Baked Tapioca Pudding and his wishes came true. What really made this dessert was the excellent crunchy topping. Normally, the topping is thin, much like the one found atop a Pineapple Bun. This one was much thicker and had more impact. 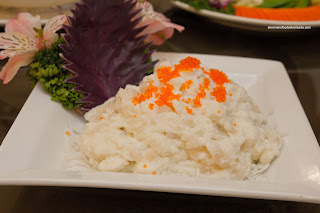 The tapioca pudding had a nice texture and the addition of lotus paste was nice. Surprisingly, the dessert wasn't too sweet which suited me just fine. Last and certainly not least was the Durian Rolls. That drew some reaction since durian can be quite pungent. If you've ever come across the actual fruit, it can quickly overwhelm. 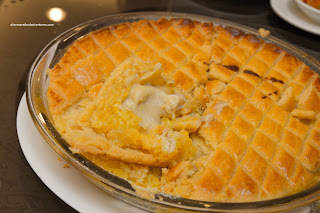 However, since it had been processed and baked into a flaky pastry, there was only flavour (which can be an acquired taste). It was definitely sweet with a certain fruit gaminess to it. I personally liked it. And on the topic of like, if I had to do my own signature dish choices, I would think that Soft Tofu and the Salty Chicken were the most interesting of the bunch. Nice meal thanks to ChineseBites. I look forward to our next meal. Love the detailed post. 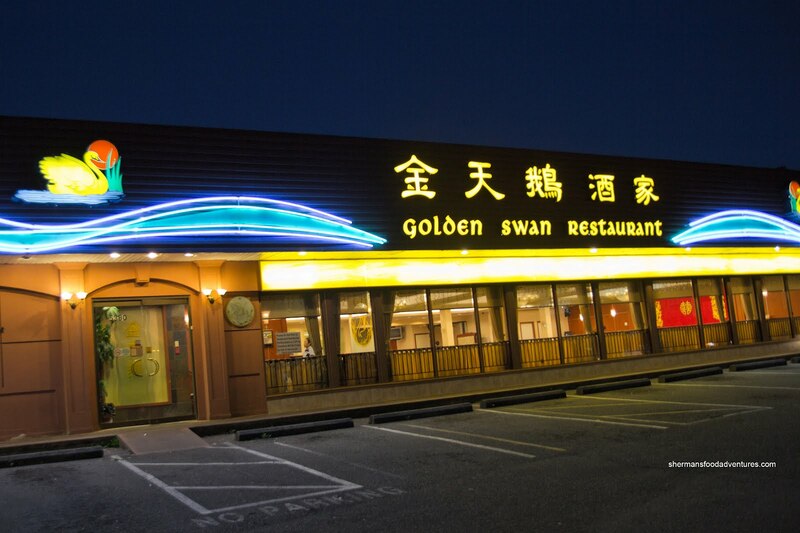 I've been going to the Golden Swan over the last few years and was disappointed with the dishes the last time we went there..now I understand it was due to the change of ownership.